Earlier this month, employees at the Chicago Board of Trade mocked the Occupy Wall Street protestors by hanging signs in their office windows that read, "WE ARE THE 1%." It wasn't a wise move, but it highlighted an important point that's been notably absent from the protests: Who, exactly, are these 1% people are protesting against? Source: Jobs and Income Growth of Top Earners and the Causes of Changing Income. Focus on the two groups targeted by the Occupy Wall Street protests: executives and financiers. Financiers' share of total national income has grown nearly fourfold since the late 1970s. Executives' share of the national pot has grown by over 70%. Let's focus on those executives for a moment. This doesn't negate anything the Occupiers are protesting, but it's interesting to know that very few of the highest paid executives come from Wall Street. According to Forbes, of the top 50 highest paid CEOs last year, just one -- Jefferies' (NYSE: JEF) CEO Richard Handler -- hailed from high finance. The top five highest paid executives were Stephen Hemsley from UnitedHealth (NYSE: UNH), Edward Mueller from Qwest Communications, Bob Iger from Disney (NYSE: DIS), George Paz from Express Scripts (Nasdaq: ESRX), and Lew Frankfort of Coach (NYSE: COH). These folks made between $50 million and $100 million last year. 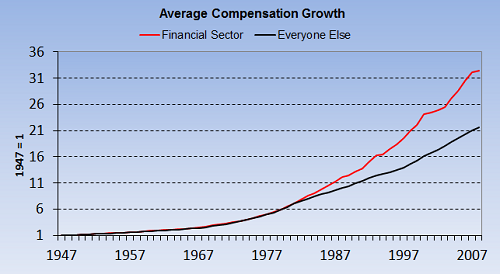 Executive pay has, in general, exploded over the past few decades. According to the Congressional Research Service, average CEO pay was 90 times an average worker's pay in 1994. By 2007, the multiple was 180 times. Too often, executive compensation in the U.S. is ridiculously out of line with performance. That won’t change, moreover, because the deck is stacked against investors when it comes to the CEO’s pay. The upshot is that a mediocre-or-worse CEO -- aided by his handpicked VP of human relations and a consultant from the ever-accommodating firm of Ratchet, Ratchet and Bingo -- all too often receives gobs of money from an ill-designed compensation arrangement. Take, for instance, ten year, fixed-price options (and who wouldn’t?). If Fred Futile, CEO of Stagnant, receives a bundle of these -- let’s say enough to give him an option on 1% of the company -- his self-interest is clear: He should skip dividends entirely and instead use all of the company’s earnings to repurchase stock. Let’s assume that under Fred’s leadership Stagnant lives up to its name. In each of the ten years after the option grant, it earns $1 billion on $10 billion of net worth, which initially comes to $10 per share on the 100 million shares then outstanding. Fred eschews dividends and regularly uses all earnings to repurchase shares. If the stock constantly sells at ten times earnings per share, it will have appreciated 158% by the end of the option period. That’s because repurchases would reduce the number of shares to 38.7 million by that time, and earnings per share would thereby increase to $25.80. Simply by withholding earnings from owners, Fred gets very rich, making a cool $158 million, despite the business itself improving not at all. Astonishingly, Fred could have made more than $100 million if Stagnant’s earnings had declined by 20% during the 10-year period. Fred can also get a splendid result for himself by paying no dividends and deploying the earnings he withholds from shareholders into a variety of disappointing projects and acquisitions. Even if these initiatives deliver a paltry 5% return, Fred will still make a bundle. Specifically -- with Stagnant’s p/e ratio remaining unchanged at ten -- Fred’s option will deliver him $63 million. Meanwhile, his shareholders will wonder what happened to the “alignment of interests" that was supposed to occur when Fred was issued options. Earning a kingly sum in America is still looked upon highly, if that pay is attached to doing something great. I haven't heard anyone in the Occupy movement complain about the fortune Mark Zuckerberg has made from Facebook. He's changed the way people live, and most feel he deserves every penny. But that's hardly the case for so many executives. The heart of what people are outraged over isn't wealth inequality; It's wealth inequality that is perceived as being undeserved, unearned, or in many cases, earned by those responsible for the economy's deepest problems. "The corporate executives who helped bring on the recession of the past three years -- whose contribution to our society, and to their own companies, has been massively negative -- went on to receive large bonuses," wrote economist Joseph Stiglitz earlier this year. Source: Bureau of Economic Analysis, author's calculations. Here, too, the fact that financiers earn more than most other workers isn't what aggravates people. It's that they earn more by doing things that are perceived to come at the cost of everyone else, and a feeling that the fuel for those higher earnings isn't ingenuity, but a pile of undeserved benefits -- a gracious Federal Reserve, a platoon of lobbyists, and, of course, bailouts. As former Fed chairman Paul Volcker quipped, the only significant invention to come out of the finance sector in recent decades is the ATM machine. Yet the collateral damage caused by the industry is almost endless: financial crises, deeper recessions, asset bubbles, it goes on and on. What are your thoughts on the 1%? Sound off in the comment section below.